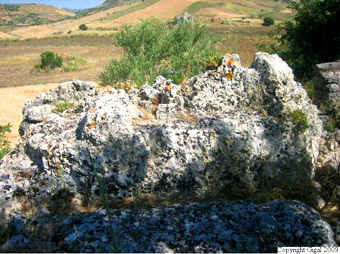 Sicily, the Mediterranean's biggest island (26,000 km²), located at the crossroads of many civilizations, reveals a human presence going back as far as the end of the Pleistocene. 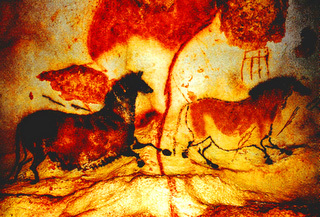 In fact drawings can be found in caves on this island dating from 6000-8000 BC, in the Addaura caves near Palermo for example, and on the Aegadian islands. 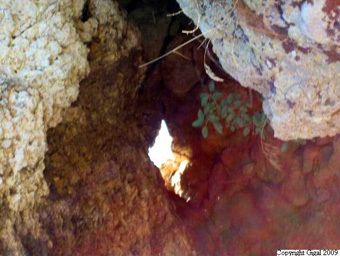 Many remains from the Upper Paleolithic are to be found. 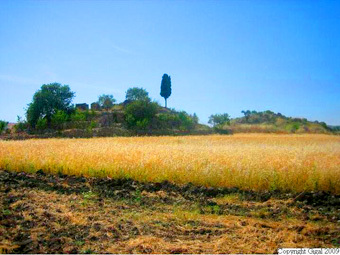 This island was the scene of numerous episodes in the mythological life of the Graeco-Roman gods; its cultural heritage is extremely rich, its early remains very diverse. Only one aspect of this heritage is unrecognized: the pyramids. It is precisely those I went to seek out for a detailed exploration with my team. 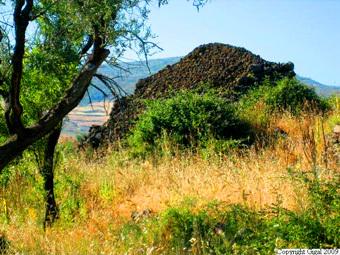 So-called "primitive" agricultural communities settled around the Aegean Sea around 6000 BC. It is said that progress towards civilization in this region was slow, way behind that of Egypt and Mesopotamia. However the truth might be more complex than that. In the Odyssey, Homer refers to Sicily as Sikania (in classical texts it is also called Sikelia) and mentions the Sicanian Mountains. 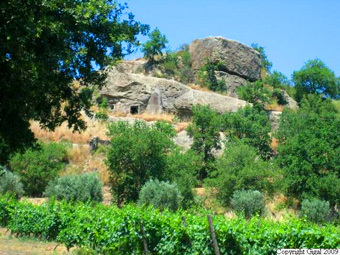 This is why one of the three native peoples of Sicily was named the Sicani (Sikanoi or Sicanians). They were probably there from 3000-1600 BC, from the earlier proto-Sican period, where various Mediterranean influences reached the Neolithic population that was based more in the central and western part of the island. Much of our knowledge concerning the ancient Sicilians comes from Greek authors such as Diodorus of Sicily, but they say little about the Sicani. The Greek historian Thucydides (460-394 BC), father of scientific history and political realism, considered the Sicani to be a tribe from Iberia. Some linguistic factors suggest this, and there is the Sicano river in Spain, but this thesis has no definite proof. Their name probably comes from the word "sika", designating the chalcedony that has been found in great quantities in the valleys where they lived and which they used to make their Neolithic tools. It is known that they lived in autonomous confederations and that they had close links with the Minoan civilization (4000-1200 BC) in Crete and with the Mycenaeans (1450-1100 BC). It is also known that the Minoan civilization with which the Sicani were thus connected made a sudden leap forward around 2000 BC and took the lead among European cultures. 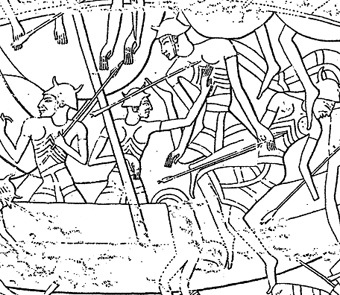 One theory suggests that this was thanks to Egyptian refugees escaping the time of troubles, bringing with them their techniques and their commercial links to Mesopotamia. In fact during that same time the Minoans invented a form of writing based on a hieroglyphic system. According to Thucydides, it was the Sicani who defeated the giant Cyclops. In any case, before the arrival of the Sicels or the prehistoric people from whom they descended, they certainly occupied all of Sicily. Around 1400 BC there was a major migration from the shores of Calabria on the Italian peninsula of the Sicels (Si'keloi), who flooded into Sicily, settling mainly in the east of the island and pushing back the Sicani to the west. The Greek historian Philistus from Syracuse (4thC BC), author of a History of Sicily (Sikelikà), tells that this invasion originated from Liguria and was led by Siculo, son of King Italo, whose people had been forced to move by the Sabine and Umbrian tribes. 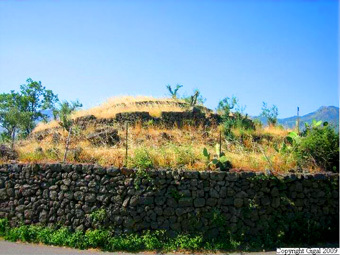 Some modern researchers think that Siculo and his people originated from even further away, from the east. Prof. Enrico Caltagirone and Prof. Alfredo Rizza have even calculated that in the modern Sicilian language there are more than 200 words that come directly from Sanskrit. Then from the Bronze Age and classical antiquity there is evidence of another Sicilian people, the Elymians, who migrated from Anatolia and may have been descended from the famous "Sea Peoples". The west of Anatolia was then occupied by non Indo-Europeans. Thucydides said they were refugees from Troy. Indeed a group of Trojans are supposed to have survived the defeat of Troy, having escaped by sea, and settled in Sicily and mixed with the Sicani. Virgil even writes that they were led by the hero Acestes, king of Segesta in Sicily, who gave help to Priam and Aeneas, and had Anchises buried in Erix (modern Erice). View from the heights of Erice where Anchises was supposedly buried. 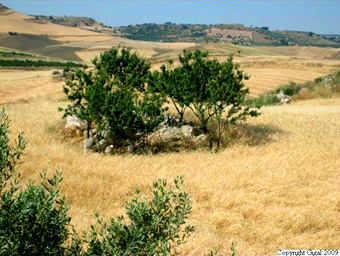 Thus they settled around the towns of Segesta and Erice. The specialists still find it difficult to interpret their language and I do not believe this Trojan origin to be imaginary as some have said. To be completely sure, it would be enough to carry out DNA analyses of the bones that have been found. In any case they were powerful enough to fight and resist the expansionist pressures exerted by the Greeks of Selinunte, whom they managed to contain; they also made close links with the Carthaginians. In the 8thC BC, Sicily began to be colonized by the Phoenicians from Carthage, who were allied with the Cretans, and by the Greeks, Corinthians, Ionians and Megariens. Thus we can see that it is not easy to tell which of these three peoples built the pyramids. 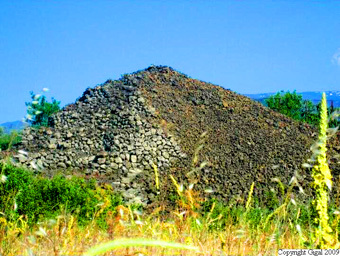 The first thing to consider when studying these Sicilian pyramids is that most of them are placed in a semi-circle around the volcano of Mount Etna. 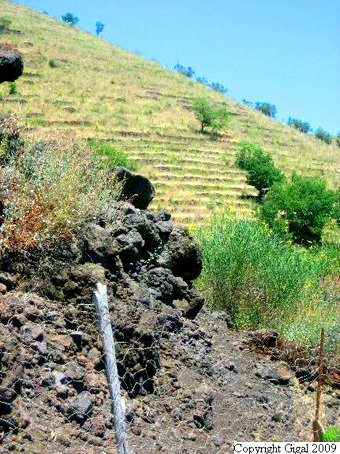 Surroundings of Mount Etna where the pyramids of Piedimonte Etneo are located, as far as beyond Randazzo. Mount Etna - Aïtné in Greek, Aetna in Latin, Munce Beddu ('white mountain') in Sicilian, Mongibello ('beautiful mountain') in Italian, Jebel Utalamat ('mountain of fire') in Arabic - is the world's oldest active volcano. 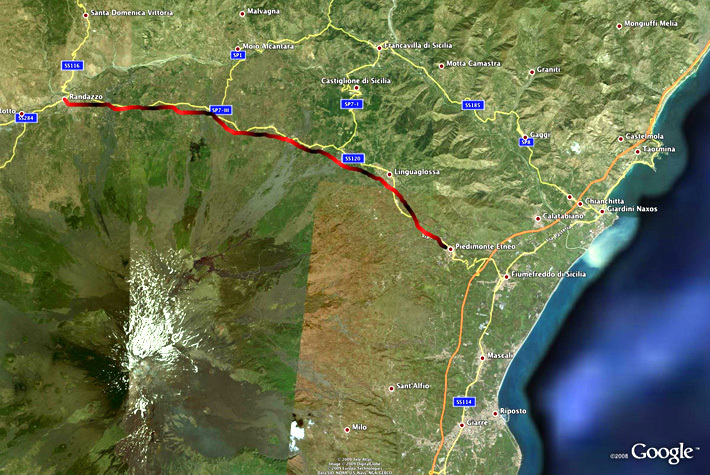 It covers 1190km², with a 165km² circumference. Depending on the eruptions, its height varies between 3326m and 3350m, and its central crater is 0.5km wide. 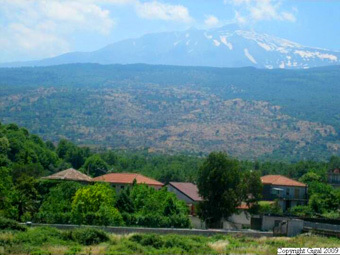 It is a strato-volcanic volcano, with the town of Catania at its foot. 700,000 years ago, in the Quaternary Period, the present plain of Catania was occupied by a gulf, which was gradually filled as Mount Etna was created by multiple underwater eruptions. 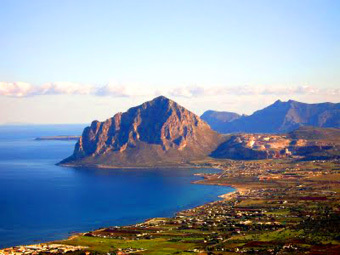 It's important to remember that Sicily is the meeting point of three tectonic plates colliding at the same time: those of Eurasia, Arabia and Africa. There are traces in the eastern Mediterranean of a tsunami caused by an eruption of Mount Etna in 6000 BC. In 396 BC another eruption stopped an armed force of Carthaginians on their way to attack Syracuse. 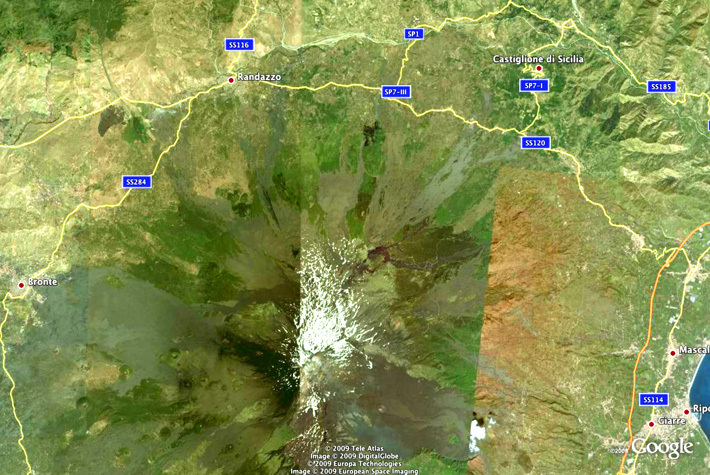 We also know that ashes from this volcano are found more than 800km from there, in Rome for example. So how come there are small pyramids surrounding such a volcano? For a start I knew that about ten of these small pyramids had already been photographed from a certain distance by some Italian photographers, but since any further information about them was entirely lacking I decided to go with my team and see them on the ground. In fact all that was available was about ten snapshots of small pyramidal structures, taken from the same angle and sometimes from far away, with little explanation and no exact location. I also tried to make a satellite search before leaving, but it didn't give much result, so uneven is the dark lava ground, sometimes covered with fruit trees and vines. Staying in Catania for several days, then in Giardini Naxos, we spent our days, from 9 in the mooring to 3am the next morning, covering the whole area by car, systematically scanning each zone by stopping on average 300 times a day, in order to get out, follow small footpaths, climb hills, take photographs and take notes and some measurements. I now have about 2,000 photos of about 30 pyramids! It wasn't easy, since many pyramids are on private property which is difficult to get into. Others are hidden under vegetation, still others have been partly or almost completely destroyed by bulldozers, or houses have even been built right on the top of them, to take advantage of the perfect stability of their platforms! I thought I would just find the pyramids that had already been photographed, thinking these were the only ones, but it was with great surprise that I discovered many more! Perfect little pyramids made of lava stone, apparently never identified! Very soon, as we got closer, walking around them and observing them at different times of day, one thing became obvious: all the pyramids built around the slopes of Mount Etna had been built by the same civilization, with the same type of lava stones in the same arrangement, with the corners built in the same way. We realised that there were several styles of pyramid, spread all around the volcano. From Piedimonte Etneo via Linguaglossa, Passopicciaro, Randazzo and Bronte, as far as Adrano, we thus identified rectangular step pyramids, square step pyramids, rectangular pyramids with rounded corners and curved steps - some with altars on top - and round conical step pyramids. 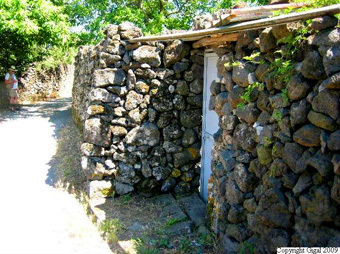 We also saw a great many narrow paths paved with lava stones, enclosed between two low stone walls built in the shape of scales, that had not been used for a very long time. Almost lost among the cactus and thorny bushes, they connect the small pyramids to certain places near the old villages, making a network of narrow winding lanes marking the boundary of myriads of small enclosed fields surrounded by walls 4m high, sometimes with places for doors and windows. 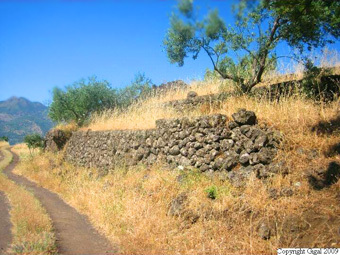 … We also noticed terraced hills with very old systems of channels and irrigation, and on the slopes of the hills facing Mount Etna, narrow stone steps forming a sort of theatre that doesn't seem to be Greco-Roman. 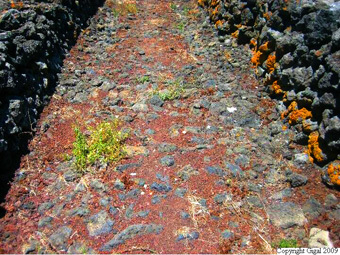 The strange winding processional way made of lava stones with typical low walls, leading to the Catena Pyramid. Closer view of the path. Gigal in front of the Catena Pyramid. One can see the seats and the theatre-like circular arc. Thus, even in Catena, after Linguaglossa on the other side of the road going north, at the end of a modern lane surrounded by houses and small farms, one suddenly finds on the left a sinuous path paved with very old jet-black lava stones framed by two low walls that leads to a group of trees, where there suddenly appears a perfect little step pyramid that someone has tried to destroy without success, and that even has a still visible access ramp on the west side. 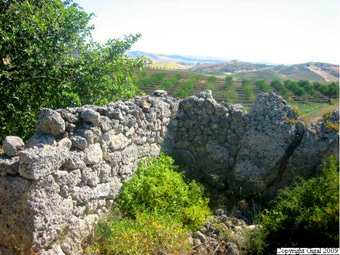 All of it is surrounded by sections of ruined walls that make an ensemble, the whole place being gradually being smothered by wild vegetation. Going back on the same path but carrying on straight towards the hills, we were walking the whole way past low walls of a particular shape, wide and thick, that are found only near the small pyramids. 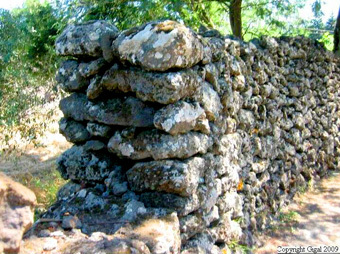 The incredible thing is that they are exactly the same as the walls that we found in Plaine Magnien in Mauritius, near the Mauritian pyramids! Then we saw, on at least three hills, an arrangement of steps in an arc that looked like a real theatre, with a flat area at the bottom paved with large flagstones, exactly opposite majestic Mount Etna. 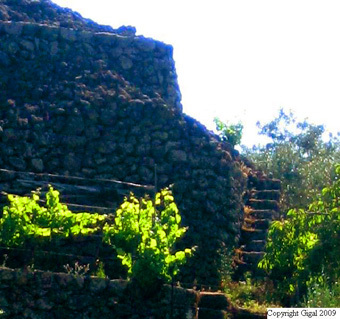 The steps are very narrow, not really wide enough for growing anything (although nowadays they try, with much difficulty, to cultivate vines and some olive trees); the angles are perfect and the assembling of the stones is very skilful. This place is a remarkable example of what could have been a place of worship dedicated to the volcano. 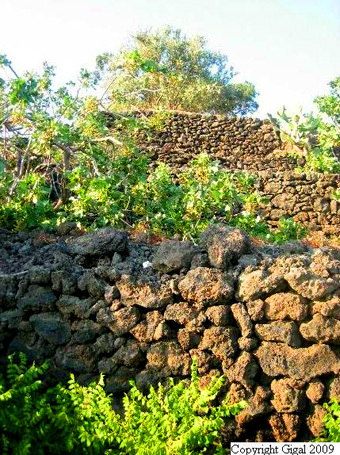 Stone lava wall behind the Catena Pyramid. 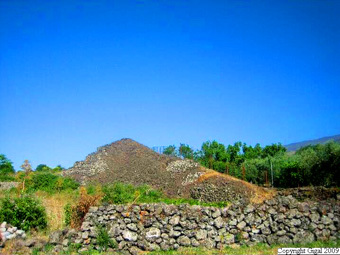 The small pyramid of Catena. 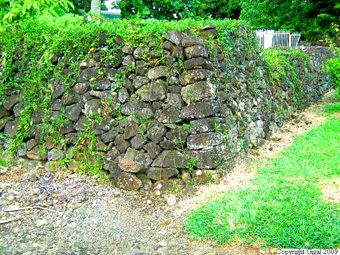 Stone lava wall behind the pyramids in Mauritius - the resemblance is striking. (Photo by R. de St. Simon, for Giza for Humanity) Majestic Mount Etna as seen from the semi-circular steps in Catena. Let us not forget that the word Etna is the name of the Sicilian nymph who became the goddess Aetna (Aitnê, Aitna), which comes from the Greek Aitne - aithô, "I burn". She was also called Thalia. Aetna was the daughter of Gaia (the Earth) and of Ouranos (the Sky), who gave birth to the Giants, Titans, Cyclops (one of whom is called Bronte, like the city in the east of Etna) and the Furies (one of them being Megaera, who also gave her name to a Sicilian city). Aetna had twins by Adrano (Adranus), a god who had many characteristics in common with the god Hephaistos: he lived under the volcano, and certain researchers even liken him to the gods Adar in Phoenicia and Adramelech in Persia, all personifying the Sun and Fire. Adrano, god of the Sicel people who settled around the volcano, was worshipped in the whole of Sicily and particularly in Adrano, the city that bears his name, located on the sides of Mount Etna, where the construction of the pyramids ends. 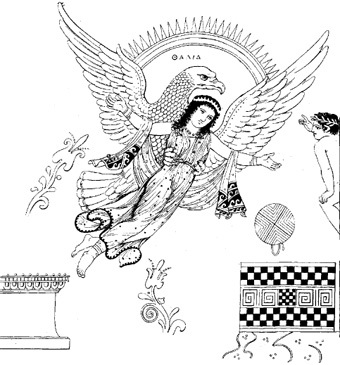 Being jealous, Hera had Aetna's twins swallowed by the Earth, but the latter restored them; this is why these Chthonian children are called "Palici" (from the Greek palin, "again" and ikein, "to come"), "the twice-born ones" mentioned in Ovid and Virgil. They became the Sicilian "patron saints" of agriculture and navigation, while being considered more locally as the gods of the geysers and of the volcano's underground world. It is interesting to note that the myth of the twice-born also exists in the Near East and in Sanskrit (Dvija). In any case it is known that in a temple dedicated to Adranus the Sicels maintained an everlasting fire, and according to the Roman author Aelianus, in the past about a hundred sacred dogs were kept close to this temple. Thus it is clear that very important rites must have been organized around the volcano, even before the Greeks and the Romans. 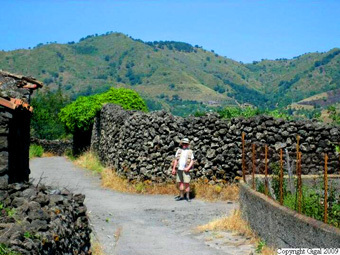 On the other side of Linguarossa, on the northeast slope of Mount Etna, we found an area of several square kilometres covered in a myriad of winding alleyways surrounded by walls enclosing small gardens, sometimes up to 4m high and 80cm wide, which don't exist anywhere else in Sicily. 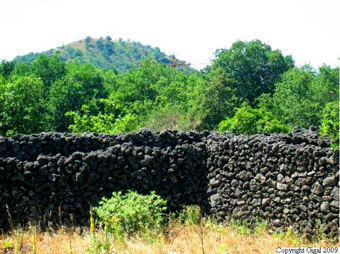 They are built just like the pyramids in lava stone, with the same arrangement and the same degree of weathering. These walls are really impressive. Nowadays some of the fields they enclose have buildings in them and we saw some pyramidal structures used as the foundation for small houses. It is difficult to see exactly what is in the small enclosed fields as these are private properties, now planted with trees and market gardens. Higher up, still on the north side of Mount Etna, at 887m, behind the walls of a private property, we saw an extraordinary lava stone step pyramid, measuring about 35m high (the top levels are in ruins), the base measuring 23 m wide, with very steep stairs on one side giving access to the upper terraces. 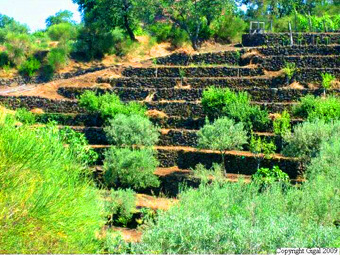 At the foot of this pyramid there are all kinds of terraces forming a structure around it, now partly covered with vines and olive trees. Very thick 2m high walls in the age-old winding lanes. 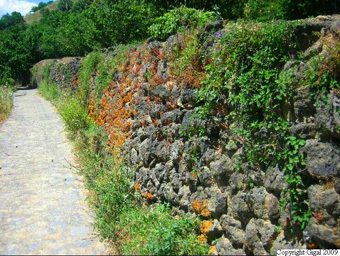 Walls 2.10 to 4m high, running alongside winding lanes. Sometimes the walls have passageways and perfect corners. 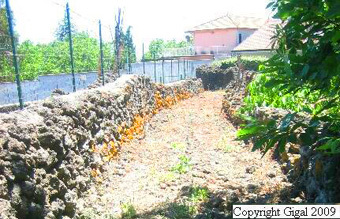 Walls running for kilometres between the small pyramids and Mount Etna. 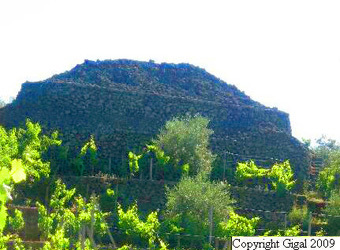 The rectangular step pyramid with stairs on the side, at 887m on the north side of Mount Etna. Closer view of the access stairs. Interestingly enough, as our observations progressed we saw that all the pyramids have either stairs or an access ramp leading to the top. 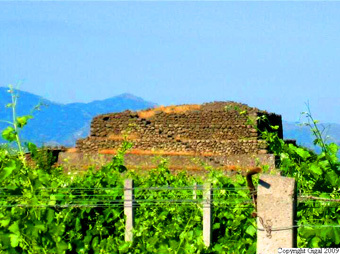 The same thing happens between Linguaglossa and Randazzo where one finds among other things, in the vineyards, a perfect rectangular pyramid with six levels, and a small stairway carefully built across the width of the pyramid, sideways on to Mount Etna. Perfect rectangular pyramid with a narrow stairway on its side. Bricks stacked to dry on the sunny side of the pyramid. 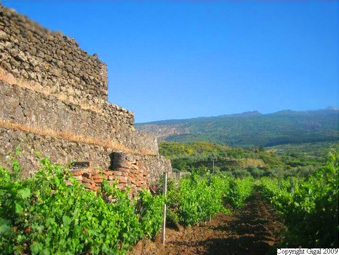 Between Passopisciaro and Francavilla de Sicilia there is a remarkable rectangular pyramid, oblong, with steps as straight as if drawn with a ruler, which make a sort of winding walkway around the pyramid as the corners are very curved. Some kind of crenellations can also be seen, with gaps to enable water to escape. 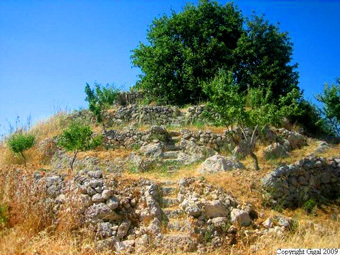 At its summit is a small stairway leading to the final platform. Thus the pyramid itself incorporates a processional path leading around it and to the top. It is quite clear that one could climb it, going round all the sides to reach the summit facing the volcano. Pyramid with very straight steps and a small stairway at the top. The six levels are clearly visible. Look at the round corners of this otherwise rectangular pyramid and note the beautiful crenellations on the 4th step. Rounded southern corner of the pyramid. Opposite northern corner, also rounded. Spiral summit of the pyramid with openings for drainage. West side of the same pyramid. West side of the rectangular pyramid. 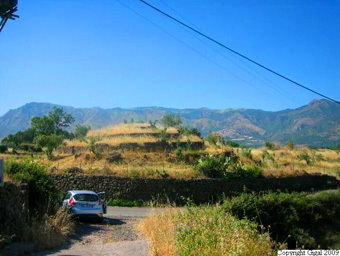 Road between Randazzo and Bronte with other pyramids, snow on the peak of Mount Etna. 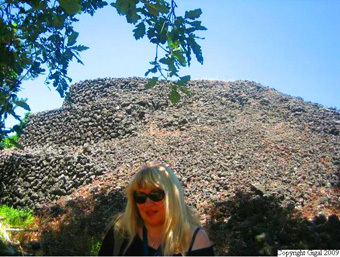 On the way between Randazzo and Bronte we found several small pyramids of classic pyramid shape (we counted about ten of them, some very damaged), lost in the vegetation around Mount Etna, all with access ramps making a processional walkway up the pyramid. Then going on towards Adrano, we found some small pyramids high up on very steep slopes that also have stairways to their terraces. Small pyramid on this road with an access ramp in ruin. 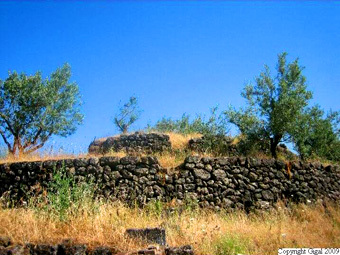 Small pyramid with its access ramp in ruin. The access ramp can be clearly seen on the right. Closer view of the same. 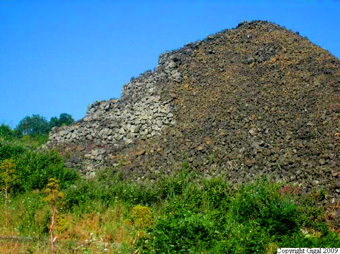 Small rectangular step pyramid in the direction of Adrano on the steep side of Mount Etna. We also observed some complicated terrace structures that seem to date from the same period as the pyramids and which seem to have been used for an ancient irrigation system. A spring has been enclosed at the bottom and narrow channels run down from the top steps to distribute the water. 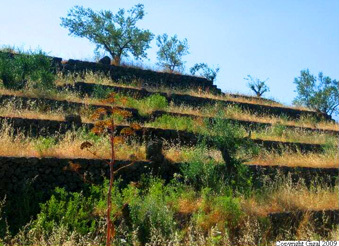 These steps do not seem to have been used originally for agriculture because it is extremely difficult to grow anything there; there are just a few vines at the top and some olive trees at the very bottom but on most of the steps there is nothing growing. We have noticed also that many pyramids are located near important megalithic sites and standing stones. 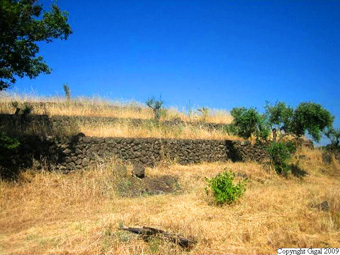 Steps used for distributing water Megalithic site near Castiglione di Sicilia and near the pyramids. 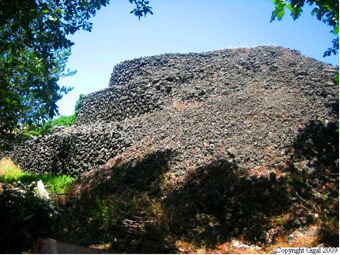 We thus observed that despite the differences in their shapes, all the pyramids had access ramps or stairs leading to the top with an exceptional view of the peaks of Mount Etna, and that they were all positioned around the volcano just where it was the most dangerous because of its lava flows. How surprised we were to notice that in many places gigantic lava flows had stopped abruptly, frozen in time just a few steps away from these pyramids. This is an observation we made after having studied the surroundings of 27 pyramids. Scientists from our team at www.gizaforhumanity.org have started to think about this, and our physicist in the field has started to put forward a theory that in future will be worth studying in depth and directly testing on the ground, which will definitely make a fascinating experiment. Thus, according to this idea and taking into consideration everything we have observed on the ground, it is possible to propose the following concept. Creating a spiral path that has a focusing effect around a pyramid or a conical, cylindrical or semi-spherical high point condenses the unified field because it creates a resonant cavity, i.e. an antenna. Every spiral has its own resonance, which means that there might be a shift, on and around the spiral path, in the flow of time and the mass of surrounding objects through a process activated by walking in a particular rhythm on the processional path, which thus creates a particular resonance. Was this an ancient technology making it possible to stop the lava flow? In any case it would be worth studying and testing. It's well known that soldiers marching in step across a bridge can destroy it, which is why they break their rhythm before crossing the bridge so that it doesn't start vibrating. It is interesting to see, on an old map of Sicily, a circle shaped like a snake surrounding the volcano, just where the pyramids are located. An enormous flow of lava has come to a sudden halt near the pyramids. 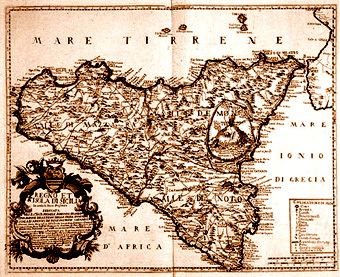 Old map of Sicily where a circular snake is depicted around Mount Etna in the place where the pyramids are located. 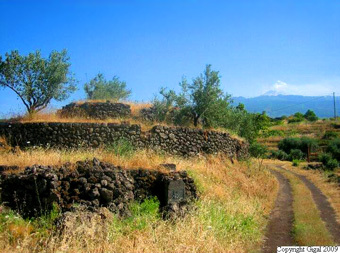 Then, in addition to the pyramids of Alcantara Valley around Mount Etna, we went to the middle of Sicily in order to study a pyramid that had already been filmed: the pyramid of Pietraperzia near Caltanisseta. This pyramid is very difficult to get to because one has to follow narrow, twisting dirt tracks for dozens of kilometres, but it was worth it. Not only did we discover in the middle of the wheat fields a magnificent round step pyramid, with two standing stones at the top in two small roofless rooms and a spiral path to the top, but we also discovered three other pyramids in the distance, perfectly similar and never identified until now. 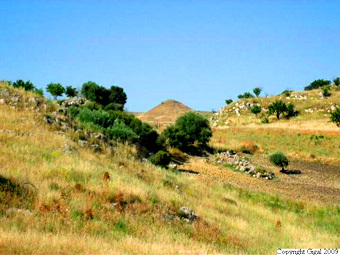 The round step pyramid of Pietraperzia, with another one behind hidden under vegetation. The pyramid with its access stairs and its five levels. 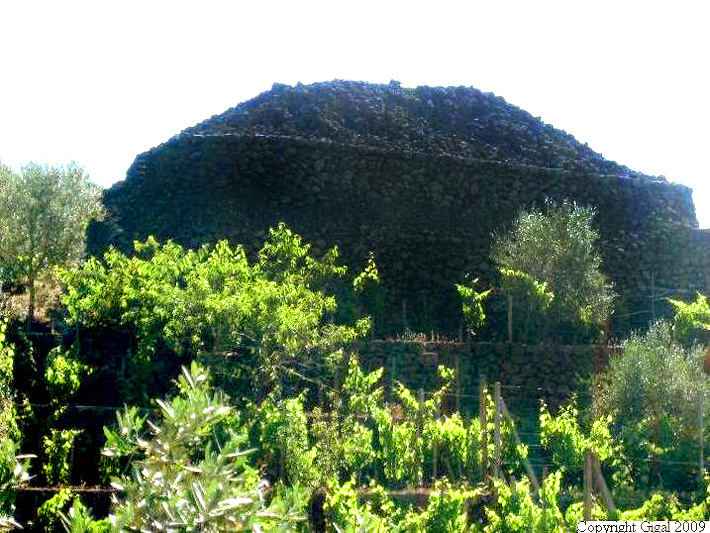 The second round pyramid of Pietraperzia, seen from the first one. 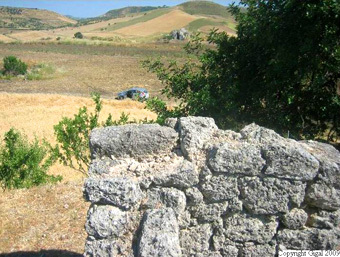 The Pierced Stone of Pietraperzia seen from the first pyramid, beyond the car. 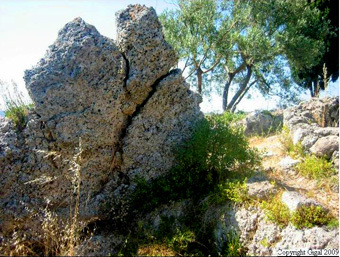 The Pierced Stone of Pietraperzia, in a straight line with the pyramids in the middle of Sicily. Inside the Pierced Stone, where a ray of sunlight goes through it and touches the pyramids at certain times of the year. We also noticed that these pyramids are in a perfectly straight line, going towards the Pierced Stone that gave its name to the place, and through which it should be possible to observe the ray of sunlight at the solstice. 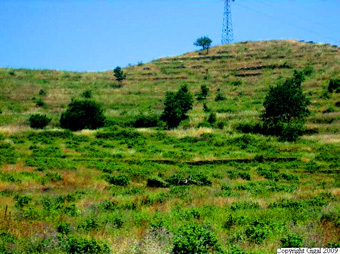 Besides, everywhere in this area are numerous structures lying under the grass, including a perfect triangular pyramid. The ancients chose this particular place in the centre of the island to set up a very important centre of worship. Two other round pyramids in ruin under the grass; between them in the distance, a perfect triangular pyramid. 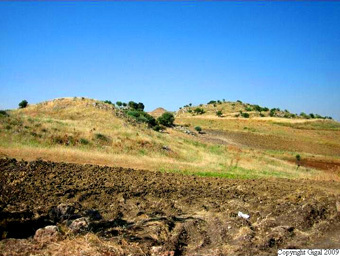 The triangular pyramid in the background should be excavated. We noticed that its summit is actually made of stone blocks. 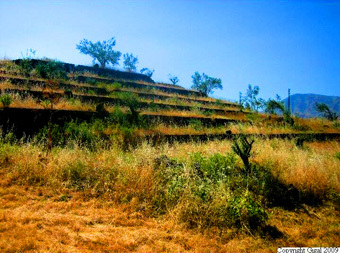 Petal-shaped terraces on the round pyramid. We observed that the round pyramids have terraces positioned in "petals" all around them. On the top, everything relates to the number 2: two small roofless rooms, separated by stairs in which are two identical standing stones where a "Y" is carved; a bit higher, a two-person seat towers above it all. Perhaps in the name of the Palici twins, the twice-born, nymph Aetna's sons, the Sicilian gods of navigation and agriculture. One of the small rooms at the top of the pyramid. One of the standing stones. The wall of one of the small rooms at the top of the pyramid continues even higher. A two-person seat at the top of the pyramid, with the remains of a narrow window looking directly at the Pierced Stone in the distance. In any case, above the seat the remains of a narrow window that looks out at the Pierced Stone in a direct straight line is proof of the presence of a sophisticated solstitial sun worship. In those days, a brilliant ray of sunlight shining straight through the structures at the solstice must have been a magnificent sight. 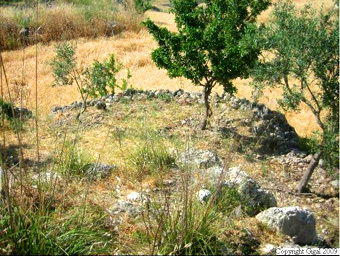 Stone altars in ruin are also found scattered here and there around the pyramids. Small altar in ruins under the trees at the foot of the pyramid. 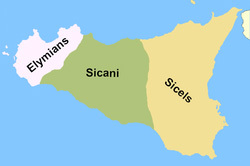 Originally the Sicani and their prehistoric predecessors certainly occupied the whole of Sicily, before the arrival of the Sicels. 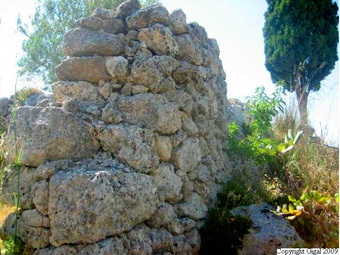 Proof of their culture is found more or less all over the island (as on Mount Kronio near Sciacca), thus it is a safe bet to say that they were the actual builders of the small pyramids, specially since the pyramids in the middle of Sicily (an area of specific Sicanian occupation) seem to be slightly earlier than those surrounding Mount Etna. Let us not forget that Sicanian culture is only identifiable from 1600 BC, but they were already in existence before that. Many things are still to be discovered about this people; their history is full of fabled characters, such as the Sicani King Kokalos who gave refuge (against the King of Crete) to the famous architect and inventor Daedalus, in Inycus near the river Belice. 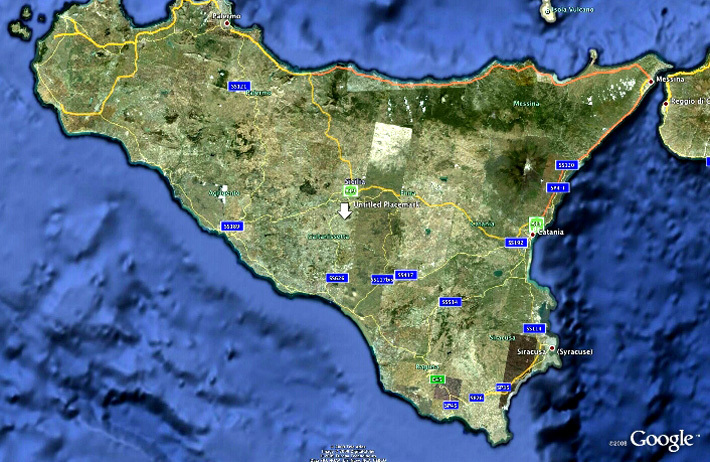 Daedalus then built fortifications, thermal baths, aqueducts, temples and reservoirs here and there all over Sicily. 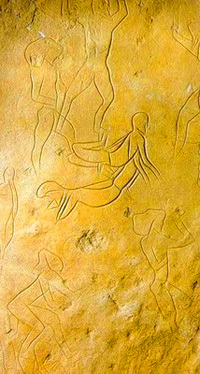 But there is another possible thesis, that of the famous "Sea Peoples", who were made up of a dozen tribes, including a mysterious group about which very little is known: the "Shekelesh", who came from southeast Sicily (according to expert N.K. Sandars). The Shekelesh, Sikala, Sikils, Siculi are a people who attacked Egypt in 1220 BC and in 1186 BC (Redford 1992, p.148) during the reign of Pharaoh Merenptah and Pharaoh Ramses III. This is mentioned in the archives of Merenptah (who ruled from 1224 to 1214 BC), where it is said that he imprisoned 222 Shekeleshs; they are also mentioned in an inscription on the tomb of Ramses III (N°157/Thebes West), as well as in the Harris Papyrus that lists the ethnic groups that made up the Sea Peoples (including the Shekelesh), and in the famous inscriptions of the Temple of Medinet Abou at the foot of the Valley of the Kings in Luxor, where the Shekelesh are described as tall, with a headdress, a medallion on their breast, two spears and a round shield. 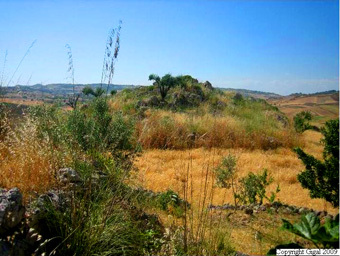 Another very interesting thing is that archaeologists have found Shekelesh villages located as far as the Palestino-Syrian corridor in Tell Zeror and elsewhere. 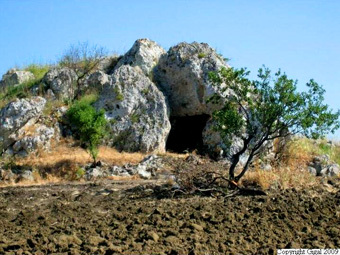 Their identification as the Sicel people of Sicily seems to be proved by the resemblance between amphorae discovered on Mount Dessueri in Sicily and those found near Jaffa in Azor. It seems that this Sicilian people, who sailed everywhere on the high seas, forged tripods and bronze cauldrons, used the wheel (fragments discovered in Piediluco) and made pottery (in Termitito), all in the 12th century BC. And then the Hittite King Suppiluliuma II warned Hammurabi, King of Ugarit, of the imminent arrival of the "Shikalayu people living on boats". Historians think these are the Shekelesh/Sicel people mentioned by Merenptah. This confirms that they were fine navigators, which could explain why the same pyramids and structures seen in Sicily are found in Tenerife and even in Mauritius (see the articles on Mauritius by this author); and certainly in other places yet to be discovered. 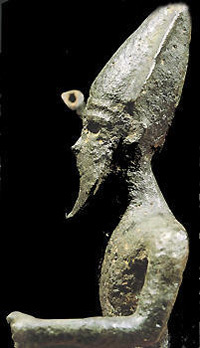 Merkart statuette attributed to the Phoenicians, found in Sciacca in Sicily; the Egyptian influence is evident. "La Sicilia e l'arcipelago maltese nell'età del Bronzo Medi", D. Tanasi, Pubblicazioni del Progetto Kasa 3, Officina di Studi Medievali, Palermo 2008. "On the Thapsos Culture in the Syracuse Area: the Problem of the Aegean Component", Gianmarco Alberti, Thesis, 2001-02. History of Greece, Connop Thirlwall, London, 1835. The Sea Warriors of the Ancient Mediterranean, Sandars, N.K., London, Thames and Hudson, 1987. "The Sea Peoples", The Cambridge Ancient History, vol. II, Barnett, R.D., 1991. "Medinet Habu Inscriptions and Papyrus Harris", Ancient Near Eastern Texts, Pritchard, J.B., Princeton University Press, 1969. The Shekelesh, Michele MacLaren et al., CAMS. Final Bronze Age Transmarine Migrations, Federico Bardanzellu. Best of Sicily: "Daedalus in Sicily" and "Sicilian People: the Sicanians", Vincenzo Salerno. Storia degli Etruschi, Mario Torelli, Roma-Bari, 1998. Testimonies from Sicilians and others following the publication of this article.